In a major moment for Hong Kong, the world’s most prominent ivory retail market, the Legislative Council of Hong Kong last week passed a movement to ban the domestic trade of elephant ivory. This could be an important step for elephants, whose numbers have dwindled from about five million in the 1900s to fewer than 470,000 in the world today. 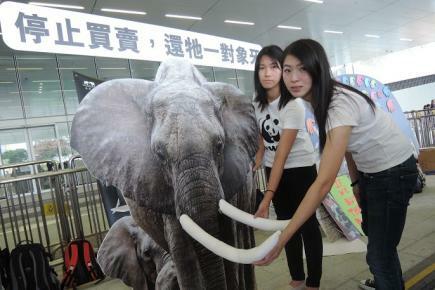 Within the past weeks, over 20,000 people have also signed a WWF petition to end Hong Kong’s ivory trade. WWF now calls for the Chief Executive to adopt the ivory ban into his Policy Address in January 2016, and other NGOs and community members are sure to echo this call. Last November, WWF – Hong Kong launched its “Rewrite Their Future” campaign, which informs the public of a movement to invent a new Chinese character for “elephant-ivory.” In the Chinese language, ivory (or elephant tusks) is known as “elephant teeth” - which creates a misbelief that elephants naturally shed their tusks without any harm caused to them. Unfortunately, the opposite is true. The removal of ivory from an elephant either immediately or eventually results in its death. While China and the US have recently pledged landmark commitments to halt the ivory trade, the Hong Kong government has resisted such a move. 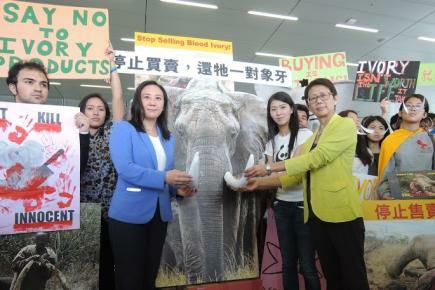 Officials from the Agriculture, Fisheries and Conservation Department (AFCD) continue to insist “the Hong Kong government has strict control mechanism in place over sale of ivory” and is comparable to other nations. In fact, nothing could be further from the truth. And despite the AFCD announcing ten new measures to tackle illegal trade, WWF-Hong Kong regards this as 'baby steps', where a more critical response is required - in the form of an ivory ban. WildAid and African Wildlife Foundation are also calling on the government of Hong Kong to ban ivory sales, and to carry out inquiries to address regulatory loopholes and illegal smuggling. They recently released a investigative report that featured undercover footage of ivory traders flouting licensing regulations with impunity, coaching tourists on how to smuggle purchased ivory, and routinely replenishing legally held ivory stocks with illegal ivory laundered into Hong Kong from recently poached African elephants. Click here to download the full report. “The corruption and obfuscation as detailed in this report is a clear indictment of Hong Kong’s failure to stop international criminal syndicates who see this region as a safe haven for smuggling. History has shown that legal ivory sales only serve to provide a cover for illegal trade, which fuels the rampant poaching we see across Africa. If elephants are to stand any chance at surviving, Hong Kong must join China and the US in shuttering its market,” said WildAid CEO Peter Knights. WWF also released a report earlier this year entitled The Hard Truth, describing how the poaching of African elephant is continually fuelled by Hong Kong through its lax regulation, with legal stockpiles being used as cover up for laundering illegal ivory. As a result, thousands of African elephants are still dying at the hands of poachers, until large-scale measures are put into place. To see the undercover video footage, please click here. (credit: WildAid/WWF-Hong Kong). To sign the petition "Rewrite Their Future" by WWF, click here. 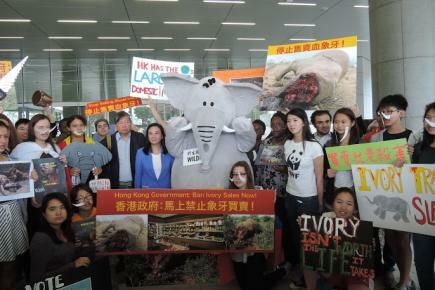 To sign a petition urging the government to ban ivory in Hong Kong, click here.